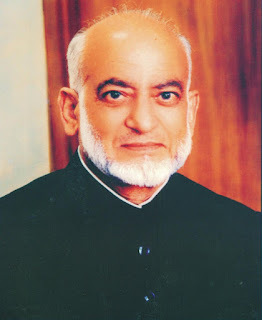 Mian Muhammad Sharif was born in Amritsar (1920). He was a Pakistani industrialist and father of Pakistan's leading political figures, Mian Muhammad Nawaz Sharif and Mian Muhammad Shahbaz Sharif. Mian Sharif immigrated to Pakistan. Mian Muhammad Sharif along with his brother created a business empire from a small steel factory. It was his dedication, hard work, sincerity and above all commitment to his country that made him hugely successful as a businessman. His story as an entrepreneur is that of struggle who achieved a lot and then all of sudden it was all nationalized. He did not lose hope nor did he stop working. He re-established his ventures in UAE and then in Saudi Arabia. He came back to Pakistan at change of political scene and re-established his business. Years later, his family was sent to exile in Saudi Arabia, where he again started his business venture and made it a success. Another amazing aspect of Mian Muhammad Sharif's personality was philanthropy, which also took form of social entrepreneurship. He established many non-profit organizations in healthcare and education sectors for welfare of people. This had been a trait of his entrepreneurial career all along. Mian Muhammad Sharif's struggle and hard work is an inspiration for Pakistanis today and they should learn from his example that how entrepreneurs are made. He died in October 2004 in Jeddah at the age of 84.